← What If We Reached Out to Youth Who Will Never Join Our Church? One of my go-to sermons while traveling around our denomination asks the question: What Do We Love More Than Jesus? and I confess that – on most days – I am guilty of loving all kinds of things more than Jesus. Sometimes I love my iPhone more than I love Jesus. But following Jesus means that we are at least trying to love Jesus as he asked Peter to love him. So this article is really interesting, especially in these days of chronic national division. Many congregations sang patriotic hymns on July 2nd. Some of those songs mentioned God. Some focused more on country. For example “God Bless the USA“ is not a good choice for Sunday worship, in my humble opinion. There are no words about honoring God or pledging allegiance to the One who invented freedom in the first place. It’s not a religious song, unless our religion is patriotism. There’s nothing wrong with loving our country or being patriotic. Don’t misunderstand me. But believing that Good American = Good Christian is a misunderstanding of the Gospel, at least as I read my Bible. Yes, we thank God for winning the citizenship lottery if we were blessed to be born in the United States of America. Yes, we have only God to thank for the wealth of our lakes and rivers and purple mountain majesties, for our natural resources, for the wisdom of our Founders (when they were indeed wise), and for the freedoms we enjoy. But we live in an imperfect nation where too many people are hungry, where health care is not considered a human right, where we have twisted the right to bear arms into a dysfunctional culture where people are shot in nightclubs, in hospitals, in schools, while driving their cars, while walking home from school, while sitting in their own homes victims of stray bullets. This is not what a great nation looks like. But more importantly, this is not what a Jesus-following nation looks like. I’m grateful to sisters and brothers in Christ with whom I might disagree on many things, but we agree that our nation is only great when we care for the vulnerable and those who’ve been systematically disadvantaged. This is a great time for the Church if for no other reason that we have an opportunity to join together to serve those who are being left behind in our great nation. My prayer today is that we might indeed be great in the likeness of Christ. 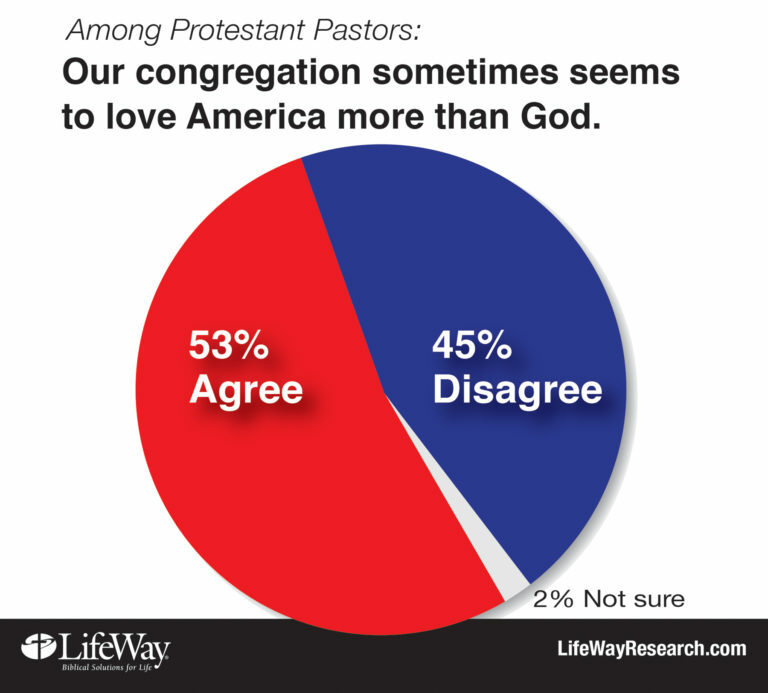 Image from Lifeway a research organization sponsored by the Southern Baptist Convention, based in Nashville.